Campus Crusade for Christ was renamed "Cru" in 2011. 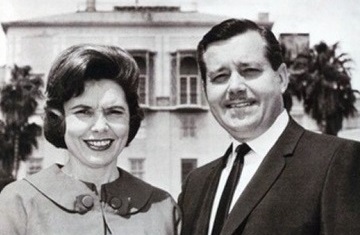 Cru / Campus Crusade for Christ was founded in 1951 at the University of California in Los Angeles (UCLA) by Bill Bright, then a 29 year-old seminary student at the nearby Fuller Seminary, and his wife, Vonette (right). After expanding across American college campuses, Cru expanded beyond colleges, abroad into 190 countries, and online (see Global Media Outreach). Bill Bright led Cru for 50 years until 2001 and died in 2003. Except for some administrative staff, everyone at Cru raises their own support, 12% of which goes to Cru (5% for overhead, 5% for overseas ministries, and 2% for supporting US minority staff). One-fifth of all funds are raised and spent outside the United States. Cru is one of the world's largest missionary organizations. In 2017, $580 million flowed through Cru to its 25,000 full-time staff, who lead over 200,000 volunteers. Cru staff, including top management, have zeal and forsake wealth as exemplified by Bill Bright, who owned neither a home nor a savings account nor accept speaking fees, donated all royalties from his books to Cru, liquidated his modest retirement funds to start a training center in Moscow, and raised his own support, which remained modest. Other missions organizations including Wycliffe Bible Translators should take notice. Clicking on "What about other religions?" on Cru's main website (cru.org) links to https://www.everystudent.com/features/connecting.html, which introduces Islam, Buddhism, New Age, Hinduism, and concludes, "The world's major religions (Hinduism, New Age, Buddhism, Islam, following Jesus Christ) are each quite unique. And of these one affirms that there is a personal, loving God who can be known, now in this life. Jesus Christ spoke of a God who welcomes us into a relationship with him and comes along side us as a comforter, counselor and powerful God who loves us. In Hinduism a person is on their own trying to gain release from karma. In New Age a person is working at their own divinity. In Buddhism it is an individual quest at being free from desire. And in Islam, the individual follows religious laws for the sake of paradise after death. In Jesus' teaching, you see a personal relationship with a personal God - a relationship that carries over into the next life," and then invites, "You can begin a relationship with God right now. It is as simple as sincerely asking him for his forgiveness of your sin and inviting him to enter your life. Jesus said, "Behold, I stand at the door [of your heart] and knock. If anyone hears my voice and opens the door, I will come into him." Would (sic) like to begin a relationship with the God who created you, who deeply loves you? You can do so right now, if it is your heart's desire: "God, I ask you to forgive me and invite you to enter my heart right now. Thank you Jesus for dying for my sins. Thank you for coming into my life as you said you would." Clicking on "Gay, Lesbian, God’s Love" on the page above links to https://www.everystudent.com/wires/gay-lesbian.html, which states, "If you are LGBTQ, see how God and his love welcomes you," and explains, "Unlike anything else you have encountered, a relationship with God does not begin with you filling in the blank, "Accept me because..." It starts with God saying, "I accept you." "I welcome you." Whether you are gay, lesbian, bisexual, transgendered or have questions, God is not your enemy. If you have not already begun one, God wants a relationship with you. He offers this to anyone and everyone. In Scripture, you'll see only one group that consistently angered Jesus...the religious self-righteous. Jesus seemed comfortable around everyone else, including prostitutes and criminals. However, the religious elite irritated and saddened Jesus. He saw them as judgmental, arrogant, unloving, and hypocritical. You might see those words and immediately think of religious people who have been hurtful, rude or judgmental toward you. Does that represent Jesus' heart? No. Jesus said to love your neighbor as yourself... Being gay, have you ever had a chance to seriously consider Jesus? Unlike any other person who has ever lived, Jesus can explain life to you...how to experience life, more abundantly," and then invites them to become Christian by praying a prayer. Jesus was angered by all who were "self-righteous," which includes those who try to justify sexual perversions that God called "abomination" (Leviticus 20:13), but showed mercy to those who admitted their sins. And loving "your neighbor as yourself" requires telling them to repent of their sins so that they can get right with God and go to heaven, instead of creating unrepentant, hell-bound false converts who boost conversion statistics. "We do not attack the Roman Church. We believe God is doing a mighty work in it and will no doubt use millions of Roman Catholics to help evangelize the world." - Bill Bright, The Past & Times Star, Cincinnati, Ohio, August 30, 1969. "There was a day when Protestants and Roman Catholics would not have much to do with one another. But today the Spirit of God is doing such a great working in both the Roman Catholic and Protestant fellowships and communications that I feel much at home wherever Jesus Christ is honored." - Bill Bright, Foundation magazine, July-August 1986. "There are many godly Catholics who are committed to helping fulfill the Great Commission of our Lord. We can work with many of these wonderful fellow believers to finish the task without compromising our biblical commitments." - Bill Bright, Campus Crusade for Christ staff letter, April 15, 1994. People who worship Mary, idolize a man as "Holy Father," and claim to cannibalistically eat human flesh and drink human blood every Sunday neither honor Jesus nor are "fellow believers" nor evangelize the world with the True Gospel. A person who lacks belief in God, obedience to God, love for God, and the desire for God's word is not a "Christian," and telling a person on a path to hell that he or she is headed to heaven in a Satanic lie that inoculates them against hearing and heeding the True Gospel. "That night God gave me the truths concerning the Person and work of the Holy Spirit that have been basic to the ministry of Campus Crusade for Christ through the years. 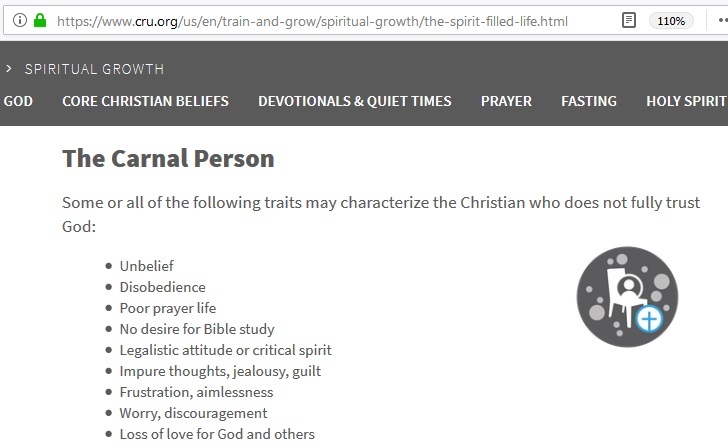 This material has now been incorporated into our Bible study course, Ten Basic Steps toward Christian Maturity, which is being used by many churches and various Christian organizations around the world. This basis and revolutionary concept of how to be filled with the Holy Spirit has been condensed into a small booklet comparable to the Four Spiritual Laws presentation and is entitled, 'Have You Made the Wonderful Discovery of the Spirit-filled Life?' This Holy Spirit booklet is being used by many thousands of Christians all over the world to help lead carnal Christians into an abundant and fruitful life in the Spirit as well as to help new Christians understand their spiritual heritage in Christ." - Bill Bright, Come Help Change the World, pp. 49-50.